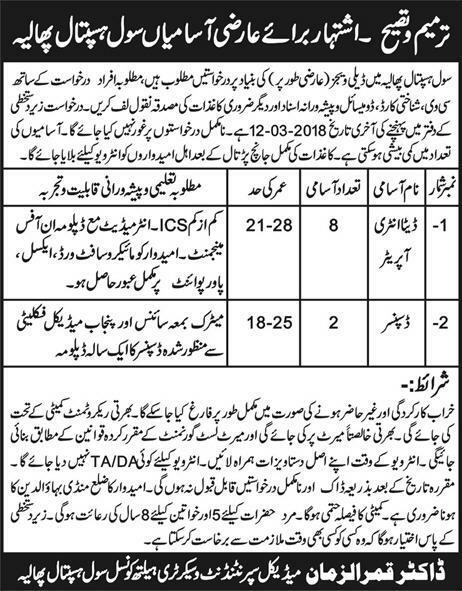 Daily Express Newspaper March 01, 2018 has announced 10 New Jobs in Civil Hospital Phalia. These jobs are announced on Daily Wages and on temporary basis. Desired Candidates can send their applications for Health Department Jobs in Punjab 2018 for the post of Data Entry Operator and Dispenser along with C.V, CNIC Copy, Domicile and Educational Certificates copies to the office of Medical Superintendent/Secretary Health Council Civil Hospital Phalia. Candidates should be citizen of District Mandi Bahauldin.